This Instant Pot Jamaican Jerk Chicken recipe features succulent bone-in chicken with boldly spiced Caribbean flavors, beautifully finished on the grill. Note: I’ve updated this recipe to pressure cook for 10 minutes. I used to recommend 12 minutes, but the chicken can get overcooked especially if you’re grilling afterward. 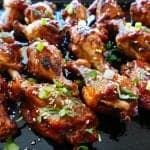 If you’re looking for a change from traditional barbecue chicken, you’re going to love this boldly spiced Instant Pot Jamaican Jerk Chicken recipe. Traditonal Jamaican jerk chicken has the perfect blend of spices (sweet, sour, hot), is grilled in the ‘jerk’ style and is sold at roadside stands throughout Jamaica. Jerk chicken is normally made with Scotch bonnet / Caribbean red peppers, which are a relative of the habanero pepper and are very spicy, with a slightly sweet touch. Another important flavor component in Jamaican jerk chicken recipes is allspice. In this recipe, I show you how to make my oven version of Jamaican Jerk Chicken adapted for the Instant Pot. I don’t use chicken breasts in my cooking much – I much prefer the taste of chicken thighs and drumsticks, which are especially well-suited for the Instant Pot. 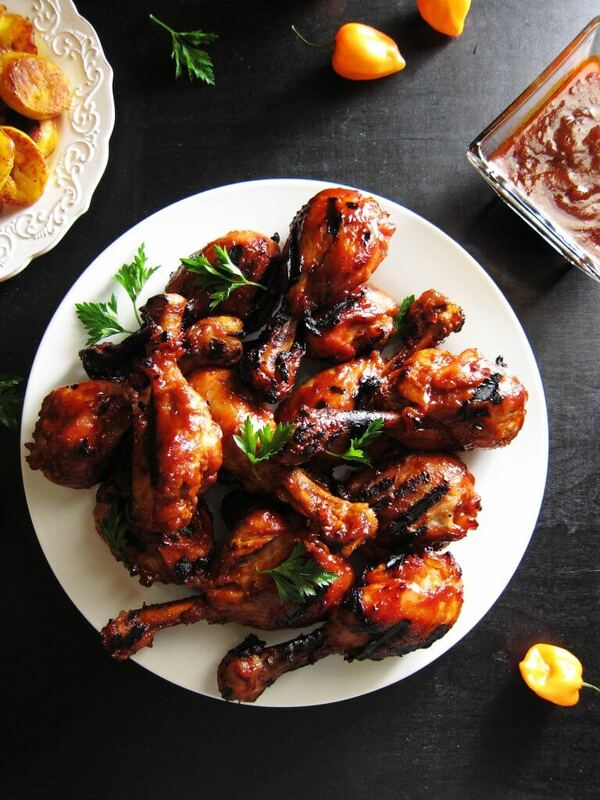 And I don’t marinate the chicken ahead of time – I just add the ingredients to the Instant Pot, cook the chicken, reduce the marinade and finish the chicken on the grill. It’s super easy. I find that meat cooked in the Instant Pot is perfectly tender with no babysitting required. And I like the flavor and look of finishing the chicken on the grill. It takes less than 5 minutes of grilling time – just enough to give the chicken a nice sear. I love to serve Instant Pot Jamaican Jerk Chicken with fried ripe plantains, black beans and rice, and a peach or mango salsa. So good! To make the fried plantains, peel them, cut them on a bias, and fry them in a non-stick frying pan with a little bit of oil until both sides are a rich golden brown. 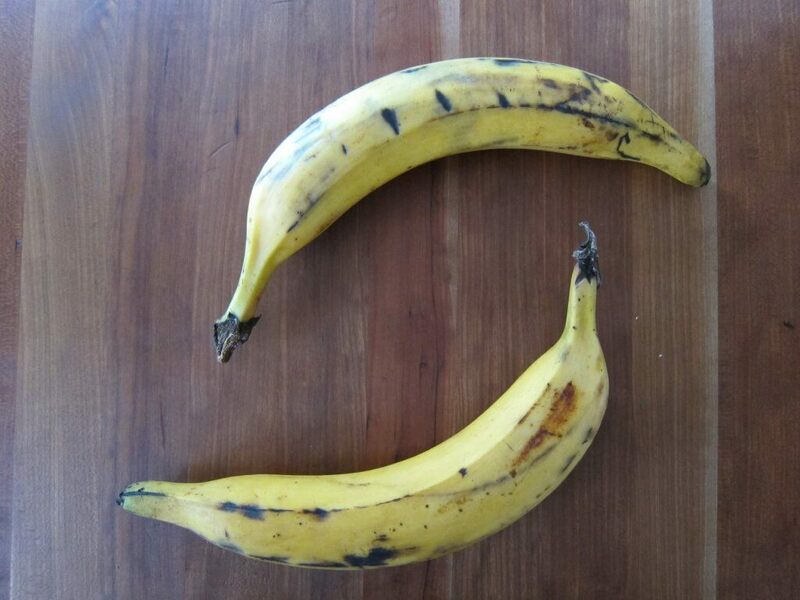 Be sure to use plantains and not bananas, and they should be ripe. A ripe plantain looks kind of over-ripe in the photo above. 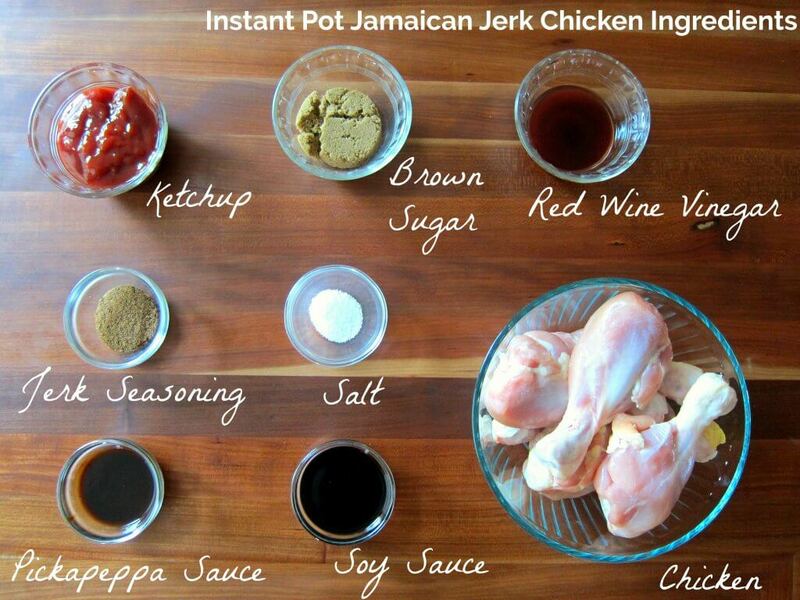 This recipe uses Jamaican jerk seasoning that is not too spicy. If you want to make it spicier, you can add Scotch bonnet hot sauce or finely chopped Scotch bonnet peppers to your chicken marinade. Be sure to use a light touch, because they’re spicy peppers! Alternately you could use a milder chili pepper. 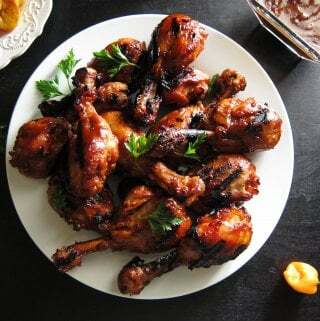 The recipe calls for Pickapeppa Sauce which is a Jamaican condiment containing tamarind. I am able to find it in my regular grocery store where the barbecue sauces are sold. You can also find it on amazon. When you’re reducing the sauce, watch for splatter. I use a splatter screen. If you don’t have access to a grill you can finish it off in the oven on the broil setting, turning once until both sides are caramelized. If you want to just grill chicken with a pre-made sauce, try the authentic Jamaican Walkerswood Jerk Seasoning. I have not used this marinade in the Instant Pot; I’ve only grilled with it. If using in the Instant Pot, you might need to thin it out with water. and aren’t familiar with how to use it, please read the Instant Pot DUO Beginner’s Quick Start Guide or the Instant Pot ULTRA Beginner’s Quick Start Guide first and then come back here to learn how to make this Instant Pot Jamaican Jerk Chicken. Add ketchup, brown sugar, red wine vinegar, soy sauce, Pickapeppa sauce, Jamaican jerk seasoning, salt to the inner pot of the Instant Pot. Add chicken pieces and stir to coat. Press ‘Manual’ (or ‘Pressure Cook’) and ‘+’ or ‘-‘ until display reads ‘10’ (10 minutes). The display will count down from 10 to 0; it will switch to ‘Keep Warm’ mode and display ‘L0:00’. * You can choose to do a natural pressure release (NPR) if you’re not going to grill the chicken. Remove chicken pieces from the inner pot and set aside. Press ‘Saute’ and reduce the marinade/sauce until thickened, about 5 to 7 minutes. If necessary, use a splatter screen to prevent splatters. Grill chicken for just enough time to get sear marks, and to give it a grilled look and flavor, about 2 minutes per side. You can either baste each side while you grill, or coat the chicken in the sauce before placing on the grill. Instant Pot Jamaican Jerk Chicken features succulent bone-in chicken with boldly spiced island flavors, beautifully finished on the grill. Stir together ketchup, brown sugar, red wine vinegar, soy sauce, Pickapeppa sauce, Jamaican jerk seasoning, and salt in the Instant Pot. Cook on ‘Manual’ (or 'Pressure Cook') for 10 minutes. Do a quick release of pressure and carefully open the Instant Pot. Remove chicken pieces and set aside. Press ‘Saute’ and reduce the sauce until thickened, about 5 to 7 minutes. Use a splatter screen if necessary, to prevent splatters. Grill chicken for just enough time to get sear marks, and to give it a grilled look and flavor, about 2 minutes per side. You can either baste each side while you grill, or coat the chicken in the sauce before placing on the grill. Serve with Peach Salsa or fried plantains, and beans and rice. Serve remaining sauce on the side. Prep time does not include steps that are already accounted for in the ingredient list, e.g. minced garlic, skinless chicken, etc. If not finishing on the grill, increase pressure cooking time to 12 minutes. Delicious! used boneless chicken breasts and cooked them for 6 minutes and grilled for a couple of minutes. Thanks for the detailed instructions, perfect for newbs! Lea, I tend to use thighs and legs so I’m glad you were able to modify the recipe for your needs. Thanks for the feedback and good luck with your new IP! what is a good substitute for pikapeppa sauce? Hi Cecile! Pickapeppa sauce has a very unique flavor because of all the ingredients in it: cane vinegar, sugar, tomatoes, onions, raisins, sea salt, ginger, peppers, garlic, cloves, black pepper, thyme, mangoes, and orange peel. It tastes kind of like a spicy worcestershire, which might be a good substitute. You could add some extra spice with a chopped chili pepper or some cayenne powder. If I could give this 6 stars I would! This is so flavorful. This dinner in the instapot is a snap, so quick and easy. Great weekday dinner. I roasted some broccoli and cooked up some quinoa, dinner in 30 minutes. I used my 8 quart instapot and did not change the recipe as it turned out great. Well, I did leave out the brown sugar, since we are trying to cut down on sugar in our home, but it still tasted wonderful.Thanks Ms. Neena. Monica – you’re so sweet! Thanks for sharing and I’m always happy to hear that your family liked a recipe! Enjoyed this. I tried Worcestershire as a substitute for pikapepper sauce, and it came out OK. Perhaps the final product tended towards BBQ rather than jerk chicken, but the flavor was still good (could also have to do with the 1 T of dark soy sauce I had to use because I ran out of the light stuff. I should add, however, that the 12 minutes for the chicken in the IP seemed a bit excessive. Mine came out well after 10 minutes. I’ve been finding most IP recipes have way too long of a cook time, and the meat is actually getting rubbery because of it. Hi Greg, thanks for your comment. Hope you get to try it out again 🙂 I think you’re right, I have been meaning to update the recipe to say that you can use less time especially if you’re grilling afterwards. You’ve reminded me to make that change, thanks! What if I don’t have a grill? Should I leave it in the IP longer? Shannon, if you can broil it in the oven for a couple of minutes, that’ll give you a similar result. If you can’t broil it either, then cook the chicken for one more minute. Thank you, Rob! I’m glad you liked the recipe. The pickapeppa sauce reminds me of A-1 steak sauce or even Worcestershire sauce. A tangy, sweet combination. In case you wanted to try and add a few drops next time. Two questions. 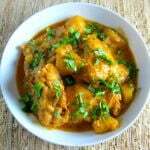 I will try this recipe tonight, I am using thighs but doubling the quantity. Have you had any issues with doubling the recipe? I will broil after, will using thighs make a difference in timing? Should I still try cooking for 10 min? Susan, thighs may require about 1 minute less time. Regarding doubling, it can be hit-or-miss with doubling some recipes with bone-in chicken. You can have issues with sealing if the chicken is too packed in. I think I’ve added a couple of more pieces and been fine. And adding more liquid can dilute the recipe. You could give it a try and just keep an eye on it. Good luck. Hello, this looks delicious. I often cook for a crowd of people, and like to make things as simple as possible the day of cooking the meal. Can these be made in the instant pot A day before serving, and then grilled the day of? Have you ever tried that? I would love to know your thoughts. Yes, you sure can prep it ahead of time. I do that often with food I plan on grilling for company. Pressure cook, remove meat, cool sauce and skim off fat. 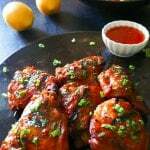 You can even store the sauce and chicken together and the flavors are stronger the next day.